A medium-screened bagged sodium chloride solar salt recommended for use as a stock salt for animal feeding. 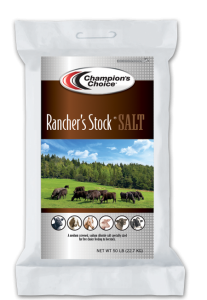 This salt product is intended for beef cattle, dairy cows, horses, goats, pigs, and sheep. Best if used with free-choice feeding programs. Mix this supplement with rations or feed-free choice to all animals. Provide an adequate supply of fresh water for all animals at all times. Ensure that average daily roughage meets required levels for all applicable animals. How much salt do cattle need? 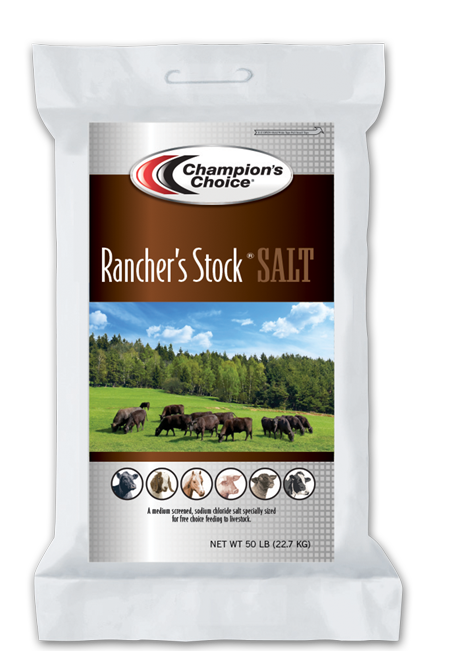 The salt requirement of cattle is met by including 0.25% salt in the total ration. Salt may be satisfactorily fed free-choice rather than as part of a mixed ration. Unless cattle are deprived, they will normally not overconsume salt. If they are deprived and then allowed to consume the right amount, they will eat excess amounts until their sodium levels come into balance in their bodies. Be sure to allow access to plenty of water during this time, as cattle will need extra water as well until salt levels are back in balance. Cattle that have free access to granulated flake or loose salt will consume approximately twice as much as they will when salt is furnished in the form of compressed blocks. Eating twice as much loose salt does not mean that cattle are overconsuming; rather, it means that cattle tongues are not optimized to lick efficiently to obtain the right level of nutrients, and that access to loose salt should be given to ensure the best chance of obtaining the right level of sodium. How do I know if my dairy cattle are salt deprived? Symptoms of salt deprivation in dairy cattle include licking wood and eating soil or sweat. Symptoms occur within 2-3 weeks of deprivation. Water consumption will become excessive and urine output will greatly increase. Also, if there are several weeks of deprivation, appetite will begin to decline and weight loss will occur, and the animal may also develop a rough coat. In a high-producing cow, the breakdown can be sudden and death can occur.